If you have specialised agricultural refrigeration storage needs, Bradley Refrigeration can offer a wide range of solutions to meet them. Our expert team can match your requirements with the most suitable technology available. And we can use those technologies to custom-design a solution that fits your business goals and site. Bradley Refrigeration offers design, supply, installation and maintenance of specialist HVAC solutions. We work with agriculture industry customers across the UK. Our systems make use of the latest innovations in HVAC technology. We can solve unusual, one-of-a-kind problems – whether you have a unique agricultural space, or you have other challenging goals. Hydro cooling systems: Cool root vegetables, such as parsnips and carrots, faster. Hydro cooling is a direct-contact method that uses immersion or falling film methods. Absorption chillers: Use waste heat from your other machinery to power your cooling system. Save energy and reduce carbon waste. Direct expansion (DX): Use less space with this cost-effective and scalable technology. Humidification and dehumidification (drying): Precisely control the humidity of your storage spaces. 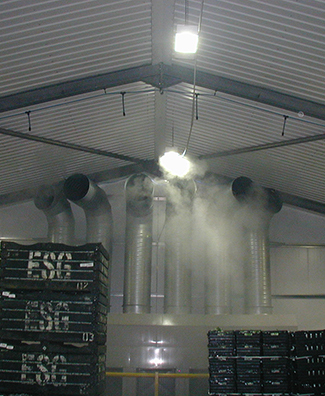 Ambient cooling: Useful for drying and curing crops, our mixed and cross-ventilation systems make use of fresh outside air where possible. Systems for pack houses and despatch areas: Achieve optimum working conditions and product temperature control using specialist cooling and air distribution systems. Protect your specialist solution with our cost-effective maintenance service. With highly skilled engineers working to recognised standards, you can maximise reliability and meet compliance where required. Our 24-hour engineer service also reduce downtime, at any time of the day or night. If you have a specialist agricultural HVAC challenge, our experienced engineers would love to share their knowledge and experience. To find out more, call our team in Sheffield on 0114 236 9971 or email us.